Give your friends and family the gift of Scottish Lordship. With the Become a Laird or Lady Gift Box, the lucky recipient will gain ownership of one square foot of land in Scotland. Obviously, that's a little small to build a dream home. But with land ownership comes the right to call yourself by the Scottish title of Laird (British equivalent of Lord) or Lady. The recipient also receives access to the breathtaking grounds of Dunans Castle in Argyll. This 16-acre tract is home to the Thomas Telford-designed Dunans Bridge, Britain's tallest tree (a 209-foot-tall Douglas Fir), and the centuries-old Dunans Castle. 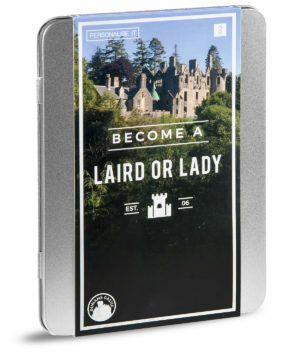 In addition to a free tour for two of the castle, your purchase of the Become a Laird or Lady Gift Set also helps fund the castle's restoration and preservation. Dimensions: 8.5" x 6.5" x 1.0"
Forget Mr, Mrs or Doctor...try a Scottish title! A one-square-foot plot of land at the Dunans Estate in Argyll, Scotland. 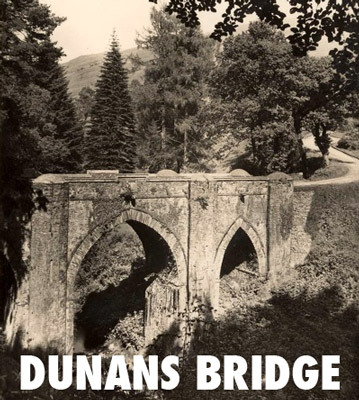 Access to the Dunans Grounds, which is 16 acres of picturesque landscape featuring the nationally recognized Dunans Bridge (built by the famous Scottish civil engineer Thomas Telford) and home to Britain's tallest tree. A commitment to preserving and restoring the Dunans Castle, which was tragically damaged in a 2001 fire. The gift box includes everything necessary for the recipient to register their plot in the Dunans Estate. So, wait, is a piece of Scotland inside the box? Not literally, but, yes, your purchase of the Become a Laird or Lady Gift Box includes a one-square-foot plot of land in Argyll. Your recipient need only register the land to title it in their name. Upon registration of their land, the recipient will receive an official Land Ownership Certificate as well as a Proof of Title card. The Proof of Title confirms their land ownership in Scotland. With land ownership comes the right to call yourself Laird or Lady. If your last name happens to be "Awesome", that means you can officially call yourself "Laird Awesome". Now that's cool. 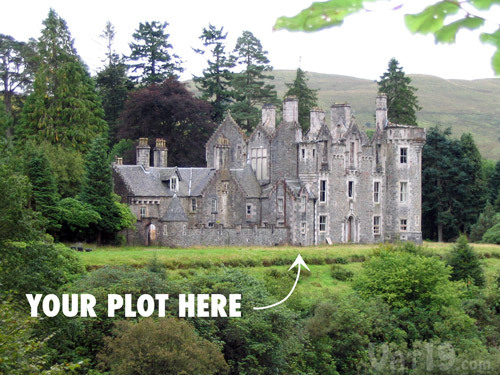 The recipient of the Become a Laird of Lady Gift Box will receive a one-square-foot plot of land at Dunans Castle. A purchase of the Become a Laird or Lady Gift Box helps preserve and restore the grounds of the Dunans Estate. Its 16 acres are located in the beautiful Scottish highlands and are host to the A-listed Dunans Bridge, the Dunans Castle, and Britain's tallest tree (a 209-foot-tall Douglas Fir). three arches, gargoyles, and hexagonal piers. Question: Will I really own this land? Answer: Yes. Once the gift is registered, you will legally own a one-square-foot piece of land on the Dunans Estate. You will also be given directions to the exact location of your plot. Question: Can I visit my plot of land? Answer: Yes. Once registered, you will be sent an ID number which indicates the exact location of your one-square-foot plot. Answer: No. Registering your plot of land is completely free and can be done online. The owner of the land is not responsible for any taxes or fees in the future. Answer: As soon as you receive the Become a Laird or Lady Gift Box, you can register the plot of land online or via the mail. Question: How long does it take to register? Answer: Registration can be done online in a matter of minutes. It may take up to 28 days to receive the Proof of Title Card upon completion of registration. Question: How do I give this as a surprise gift? Answer: Once you receive the Become a Laird or Lady Gift Box, you can register online or via the mail in the name of your gift recipient. You can then have the Proof of Title Card mailed to your gift recipient. Question: Can my title be inherited? Answer: Yes. As long as Scottish Highland Titles are informed of the changes, then your land and title can be passed on. Question: What exactly is inside the box? 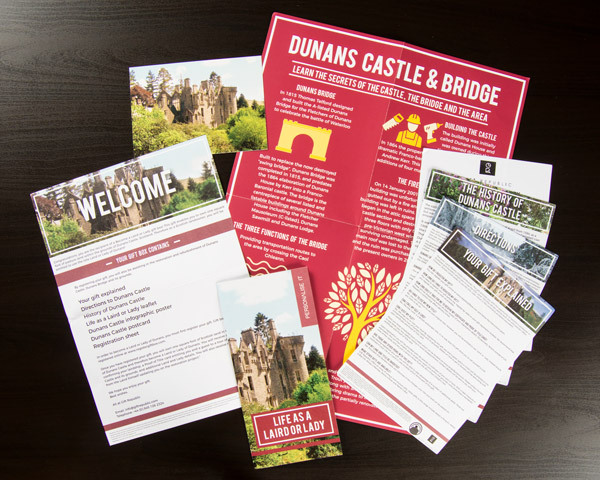 Answer: The Become a Laird or Lady Gift Box includes the following items: Welcome Letter, Your Gift Explained letter, gift registration instructions, Life as a Laird or Lady booklet, Dunans Castle: A History pamphlet, and Laird of Dunans souvenir poster.